Optique et Vision (aka Ovision) has produced a worm assembly upgrade kit (known as the NS kit) for the Losmandy G11 mount. The worm is specially machined to very tight tolerances and is mounted in a one piece worm block. I found it to be very easy to install and to adjust the mesh. This page documents the results I have measured with this new worm versus the stock Losmandy stainless steel high precision worm. First let's look at the frequency spectrum as reported by PEM Pro V2. The Losmandy worm reported a PE of +2.5/-3.3. This is not bad PE, but Periodic Error correction does not reduce the error effectively due to the harmonic at 76 seconds. Some astute investigation on the Losmandy Users Yahoo! Group have pretty much shown that the error is due to misalignment in the worm blocks which is very difficult to adjust. Figure 1. Losmandy HP Worm Frequency Spectrum. The Ovision worm fared much better. PE is reported at an amazing +1.3/-1.7 by PEM Pro. Notice that the error is dominated by the harmonic at 4 minutes making PEC viable. The 76 second harmonic has been completely eliminated. There is a noticeable harmonic at 32 seconds which I have on good information originates from the gearbox and has nothing to do with the worm. I have also noticed that the low frequency noise is greatly diminished, although I do not know why. Figure 2. Ovision Worm Frequency Spectrum. When creating a PE Curve in PEM Pro we see that the Losmandy worm has 5.32 arc seconds of PE whereas the Ovision comes in at a paltry 2.36 arc seconds. Figure 3. Losmandy PE Curve. Figure 4. Ovision PE Curve. I took the data from PEM Pro and imported it into an Excel spreadsheet. From that I produced the following scatter plots. These essentially show the unguided behavior of the respective worms. This is where the light energy of the star would fall if you imaged unguided and gives some idea of the shape of the star. Since this represents the movement that a guider will have to contend with it also has some correlation to the star shapes of guided images. Figure 5. 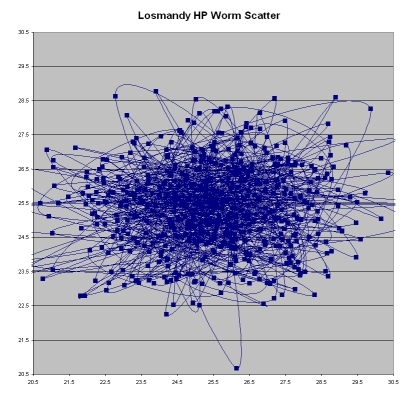 Losmandy worm unguided scatter plot. As can be seen from the image below, the Ovision worm produces a tighter star shape along the X axis (which maps to RA). Figure 6. 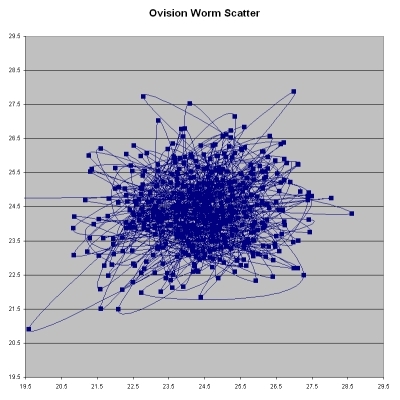 Ovision worm unguided scatter plot. Numbers and graphs are all fine and well, but how does all this affect image results? I have been wanting to do longer focal length imaging for a long time and now, with the help of Franck Valbousquet at Optique et Vision I think that is finally possible as the following images illustrate. The first image is a full resolution crop of a single 15 minute exposure taken with a Meade LX200R focal reduced to about 2000mm focal length. Even at a reduce focal length the star trailing due to periodic error is quite noticeable. Figure 7. 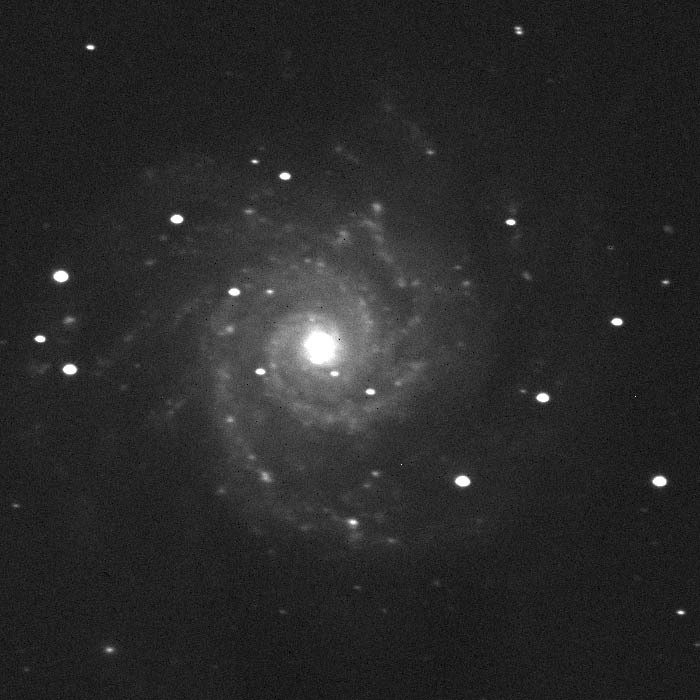 M74 taken at 2007 MASP. Meade 10" LX200R focal reduced to 2000mm. SBIG STL-11000M. Losmandy G11 with Stainless Steel High Precision Worm. Below is a full resolution crop of a 15 minute image taken with the same setup as above, with two major exceptions. First, the Ovision worm was used and second, the image was taken without any focal reduction. Pinpoint reports an image scale of 0.661 arc seconds per pixel or a focal length just over 2800mm. The stars are very nearly round; the image is certainly much more usable than the results from the Losmandy worm. It is my belief that the remaining elongation may be removed by better collimation (I did none) and PEC which I have not been able to get working yet (I think it is a back level ASCOM issue on my older laptop). Figure 8. 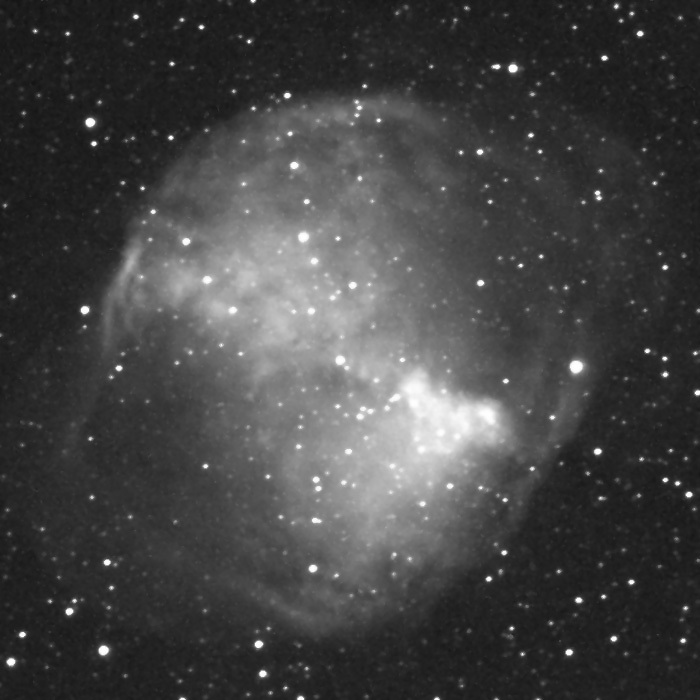 M27 taken 9/2008. Meade 10" LX200R at 2800mm focal length. SBIG STL-11000M. Losmandy G11 with Ovision worm installed as documented by manufacturer. The Ovision worm lives up to its promises. I whole heartedly recommend this upgrade to all Losmandy G11 owners who are serious about longer focal length imaging.